Last December, we decided to put your skills to the test with our brand new Winter Writing Competition! Our challenge to write a 500-word retelling of The Snow Queen was not an easy one, but you certainly rose to meet it. We were blown away by the qualities of your entries and the sheer range of directions you all took your stories in. What’s more, our competition was run across WriteStorybooks and WriteFictionBooks, so thank you to everyone who took part! But now, it’s time for the main event… who was our WriteRomance winner? Gerda stomped the snow from her boots while she waited for someone to answer the doorbell. No one had bothered to clear the path and the soft, thick drifts that lay on it were a stark contrast to the compacted snow that covered the city streets. After several long minutes, the door creaked open. A strikingly beautiful girl, silvery hair trailing her waist, glared suspiciously at Gerda. The girl shrugged. She stepped back from the door, allowing Gerda to enter. ‘His room is first on the right at the top of the stairs. See yourself out.’ She disappeared into a room at the bottom of the staircase, shutting the door smartly in Gerda’s face. Gerda puffed out a nervous breath and climbed the stairs. The door to Kai’s room was closed and her soft knocking went unanswered. Bracing herself, she turned the worn doorknob and slowly eased the door open. Shadows cloaked the room, curtains that hung drunkenly across a window only admitting light where the material had torn from the hooks. ‘Leave me alone, Eira. I don’t want it. I’m done.’ The voice—low, tired—came from a bed in the corner, barely visible in the dim light. ‘Kai!’ Joy bloomed inside her at the sound of his voice. Gerda gazed at Kai’s face. His poor face. Scabs marred his skin, a stigma of heroin addiction. Her once strong friend was gaunt. Wasted. Kai stared at her, uncertain. Slowly, trembling, he clasped her hand. Comment from the WriteRomance Team! ‘Second Chance’ does something that any excellent retelling needs to do; stand alone as its own story whilst paying homage to its roots at the same time. Karen has done a fantastic job at doing just that! 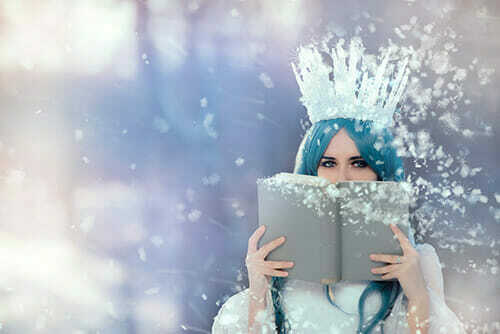 We loved how you’ve brought elements of ‘The Snow Queen’ into a gritty setting, transporting fantasy into a setting that would resonate with your audience. The relationship between Gerda and Kai is strong, as are the core themes of love and redemption, and we loved the nod to The Snow Queen in the villain’s name too. There’s some lovely imagery too, which does an excellent job at strengthening the stark reality of Kai’s misery and Gerda’s hope. It’s a quiet story, but that’s exactly what we loved about it. Well done, Karen! Karen has won an Amazon Kindle and a copy of Hans Christian Andersen’s Fairytales! Congratulations! The standard was extremely high, and we had such a difficult task in choosing just one winner. So, we also wanted to send another giant ‘well done’ to our runners-up! “He’s just like the others!” The horde cried in unison all the same. A head of silver-blonde curls soon bobbed in satisfaction and the furious wind dissipated. Small heads and eyes looked at each other in confusion to the unusual mercy, but the goblins dared not speak. A wolf’s howl echoed in the distance, but the fairy kept still. ‘Wake. Kind Huntsman.’ The fairy silently commanded her spell. He, however, remained, his eyes closed. Snow-laden pines creaked while birds took flight, but the fairy kept still. Her dainty hands gave no healing light and soon a chill ran down her spine. The mountains echoed her words, the wind flurried around her velvet robes, yet, the goblins began to murmur nervously. “Your hair, my Queen,” one servant remarked. “Your skin, my Queen,” piped another. Tears stung the corners of her angry eyes. “Silence! I’m trying to save him- I!” She cried and pinched her eyes shut as she clutched her bosom, her new heart’s rhythm pounding in her ears. “I must! I will forever try!” She swore, shouting to the starry heavens, ignoring the masses’ plea. Tiny, silvery-purple flowers and lively grass sprung within a golden glow in a miraculous swoosh of old magic, surrounding the surprised ruler’s knelt form. ‘W-What?! M-My hair is now black! My skin…warmth? !’ She frantically thought. Within a glimpse of irony, the fairy froze to the rough and sleepy greeting and silently watched a large, gloved, hand rise to touch her tan-from-pale cheek. The human weakly smiled. “D-Don’t believe…I’ve y-your name,” he chattered. Her Majesty let out a sigh as her hazel eyes met a kind green. It is decided. We are to be married in the spring. Women smile and gossip behind their hands. Little Gerda, Little Kay, all grown up and ready to wed.
Men exchange knowing glances and laugh. Best he never tries to run. That one’ll chase him to the end of the earth to drag him home again. Kay nods, as though he understands. His future is simple, now, spread before him like a patchwork quilt. He dreams of sunlight, and flowers, and a little white house in the village. He will rise early, ready to roughen his hands with honest work. In the evenings he will whistle his way home to a glowing hearth, a hearty meal, a merry wife. A plain life, and a simple one, but with love enough to season it. He has already begun to whisper of children. Stitch on stitch, his dreams weave our future together, and as Grandmother reads, I too am stitching. First a gown to wear to the church, then a white collar to crown it. Next I unpick the seams of my little-girl dresses and snip them into careful squares. Sun-bright cloth of gold, blue-white silk like night-touched snow, velvet as soft and pale as a reindeer’s nose. Corner by corner, the patchwork quilt takes shape beneath my hands, each piece a memory to hoard away for the years ahead. A square of homespun drab takes its place amongst the finery, empty as the dark between stars. The memories this scrap holds are private treasures. Firelight, the cooing of pigeons, a knife between us as we share furs and blankets. Her eyes like coals against her brown skin, her rough red lips. “Love is in the doing,” Grandmother says. And I love him, true enough. Why else follow after him, break the woman’s spell, bring him home from the endless snows? Blisters, frostbite, tears that froze to my face – all of them the price I paid, and gladly, for his safe return – my friend, my brother, my Kay. After it was over, she came to the village, my robber girl – proud as a queen on that stolen horse of hers. “The world is wide,” she said. “Too wide to be content with a hovel and a stolen life.” Her scarlet cap was glowing against the darkness of her hair. Black eyes, lips stained red with cherries. “And if I don’t care for the North Country, there are many other places to go.” And she waved farewell and promised to visit, and I knew she lied. Tears can melt a shard of ice, but what water could cool the fire that glows like a coal in the heart of me? That night I pack my bag and lay out my fine fur boots. I am ready for another journey. In the whiteness, I didn’t see your dappled horse until she stepped out of the trees. She spooked my friend Greta. Then I saw you, wrapped in polar furs and power. I didn’t feel then what I feel now for you. I didn’t see your beauty, I saw something predatory about the way you prowled the edge of daylight. I judged you wrongly. When you paused on your travels I thought you wanted to kill us. Well, Greta did. That’s why we ran away. Now I keep thinking about what should have happened if I’d stayed. I don’t know how to be romantic. Would I tell you how your lips look like luscious red roses against your milky cheeks? No, that wouldn’t work. I’ve never done this before, never wanted to. Greta said you were a white witch that brought the snow down from the mountains. It’s stupid, I know. We’d watched the snow settling for days before seeing you. It was everywhere. That’s why we left the slush in the city to throw snowballs in the clearing. It was Greta’s idea. She’s like a little sister to me. Such a child. I see everything much better now. Last week, when I was over at Mr Jackson’s farm moving hay from the loft to the stalls, something got in my eye. It hurt so much I shifted and fell from the loft, banging my chest. I was in agony, but after a couple of hours, the pain passed. Since then, I’ve seen the real world, how fragile life can be. I see the petty things for what they are. I remember the musky scent of your furs, sweet and earthy. How can I remember the way you smell, but never get the chance to hear your voice? I yearn to hear anything from your lips, just don’t laugh at me. Say one word and I’ll be with you. I know this letter will never reach you. Each of our runners-up will receive an eGiftcard for the writing course of their choosing. Don’t forget to head over to our WriteStorybooks and WriteFiction blogs to see who won these contests too, but thank you to everyone who took part! We hope it gives you an extra burst of inspiration to kick-off 2019!